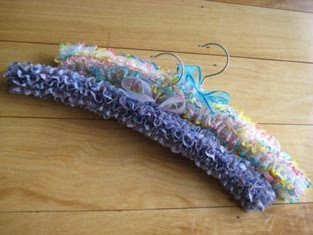 At Sydney Craft Expo in March this year, the lady who owns 'World of Lace' shop showed me how to knit the lace in with the wool to make pretty coat hangers. I have made a few of the 'simple' pattern as I'm not so skilful at knitting. The coat hangers are handy, practical and make good presents. I have kept the white one in the picture for one of my many coats as it's the first one I ever attempted. I made the purple one for my colleague, Marita. She likes it although she thinks it looks ‘daggy’.! !